If the thought of growing hibiscus causes doubt in your mind, read on for easy how-to instructions. Anyone can grow the beautiful hibiscus plants, either indoors or out. The hibiscus plant can be successfully grown both in pots, and in the ground, depending upon your location. If you live in zones 9 or 10 you can leave your plants in the ground year 'round and protect them with a layer of straw if a frost warning occurs. For those living in zones 1 through 8, the plants can be grown in pots and brought indoors when inclement weather occurs. The good news is that anyone can grow these plants no matter where they live! Hibiscus are easy to grow, so even if you feel you have a black thumb instead of a green one you should give these plants a try. The plants are available at most nurseries, so obtaining them shouldn't be difficult. One thing to remember though is to keep your new plants in a partially shaded area at first until they become established. Many people who grow hibiscus in cooler climates put these plants in the ground in their pots so they can be easily moved later. Too much shade will inhibit bloom production. 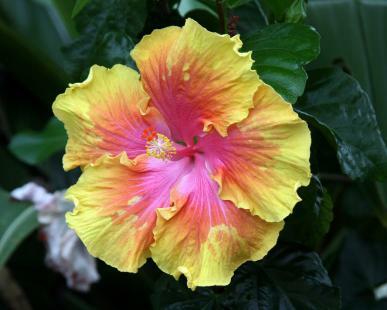 As is the case with many flowering plants, the hibiscus needs well-drained soil in order to avoid root rot. Use a mixture of topsoil, sand and compost or peat moss for plants going directly into the ground. Pearlite can be used in place of sand for potted plants. The pH of the soil should be between 6.0 and 7.0. Select an area of your garden to plant the hibiscus in. The width of the hole should be three times the size of the pot it is currently in. Carefully place the plant in the hole and back fill it gently with the same soil. Give it a good drink of water once you are finished planting. Use a balanced fertilizer for your plants such as 10-10-10. You may also use a low phosphate fertilizer to improve the quality of the blooms. Be careful to read the labels on the fertilizer and follow the directions exactly.Don't fertilize new plants until at least a month after purchase. They should have all the nutrients they need at the time of purchase. The hibiscus is easy to maintain and pruning it will help keep its shape. Prune to remove deadwood and to keep the plant's branches growing in the desired direction. After the plant has bloomed, look for the new eyes on the stems. Choose eyes that point in the desired direction, sideways or upwards. Make your cut at least a quarter of an inch above the desired eye. Always use clean pruning equipment to prevent spreading plant diseases. New growth will appear at the eye within three months.A hard prune may be necessary if the plant becomes too woody. This can occur every two to three years. To do this, cut the plant back severely to the trunk and three main branches. These pests can be treated easily if caught early. Aphids and thrips can be treated with a solution of soapy water (1 teaspoon of liquid soap to 1 gallon of water) sprayed on the plant, including the underside of leaves. Whiteflies, mealy bugs and scale can be treated with a fine oil sprayed on the plant and the underside of the leaves. Hibiscus like to be slightly root-bound. When you do put them in a larger pot, use the next size pot up from the one you are currently using. Plant your hibiscus outdoors in an area protected from prevailing winds. Mulch your hibiscus, but don't let the mulch touch the trunk of the plant. Keep it several inches away all around the plant. Check your plant weekly for any sign of pests. Take care not to over water your plants. Hibiscus plants hate having wet feet. As you can see, growing hibiscus plants can be an easy endeavor. All they need is the right care and these beautiful plants will last for years..